An annoying electronic beep or the awful pop music played by your local radio station might help you roll out of bed in the morning. 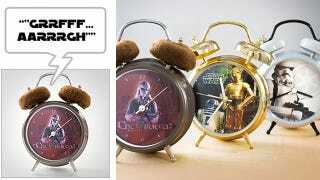 But if you really want to spring from your slumber, the roar of a Wookiee alarm clock and the fear of having your arms torn off could be even more effective. Uhh, Did Anyone Else Get Drunk and Buy a Wookiee Hoodie?